In 2002, Mahabodhi Temple, located in Bodhgaya, became a UNESCO World Heritage Site. 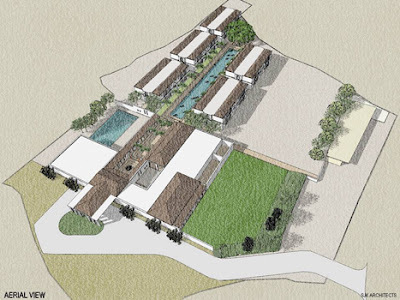 In 2010, architect Shimul Jhaveri Kadri, known for the intrinsic connect with her clients and the deliverables was asked to design a hospitality project for the visiting pilgrims here. Ever since I’ve known Shimul over the last 16 years, the woman behind the architect surfaces each time she is faced with a challenge, taking a strategic course that ascertains project-pertinent resolutions and infuses it holistically with its individualistic essence. Her recent foray into “religious tourism”, as she calls it, with hospitality projects at Tirupati, Rishikesh and Bodhgaya have brought to life yet another side of the designer as she delves deeply into the contextual elements and literally evolves her design from the cultural cauldron of a place ensconced in its idiosyncratic teachings and influences. With a deep understanding of the pragmatics and the sentiments involved in this sector of religious tourism, Shimul, in her customary style, first concretized her thoughts with a recce of the geographic location, the ethos of the people and the place, and the interface between both, dominant and subtle architectural nuances that embody Bodhgaya. At Bodhgaya, Buddhism prevails... in the architectural vocabulary of the East-Asian influences, where the religious sect was predominantly practiced. Using these architectural references as take-off points in her design, the Mumbai-based architect has categorically created her structure - with allegorical references to the windows, roofs, kund, courts and courtyards etc. The arches, domes, cornices and trellis-work are beautifully integrated into the modern idiom. Spread across 70,000 sq. ft., the site proposes to house a U-shaped ground plus two-storey structure that has a mélange of inside and outside spaces. Creating from the inherent characteristics of the local architecture and giving back to the people in an attempt at bonding them with the pilgrimage site, the proposed hotel project strives to give definition to the design exercise in its holistic ensemble. The project currently awaits its construction go-ahead. JOURNEY OF THE ARTIST... To view the book online, please go to:http://www.blurb.com/bookstore/detail/2427685 Posted by Leon Nicholas on linkedin Group: Visual Artists and their Advocates.